Flemish painter. He was the son of the landscape painter Tobias Verhaecht, the first teacher of Rubens. Willem grew up in a cultivated milieu of art and humanism and was taught to paint by his father. In 1615 he went to Paris, where he stayed until 1619; thereafter he travelled to Italy and in 1626-27 returned to Antwerp, where he became a master in the city s Guild of St Luke. 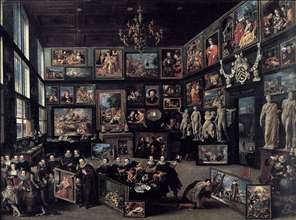 By 1628 he was employed by the patron, collector and amateur Cornelis van der Geest as curator of his collection, a post he held until his death. See more details about "The Gallery of Cornelis van der Geest"